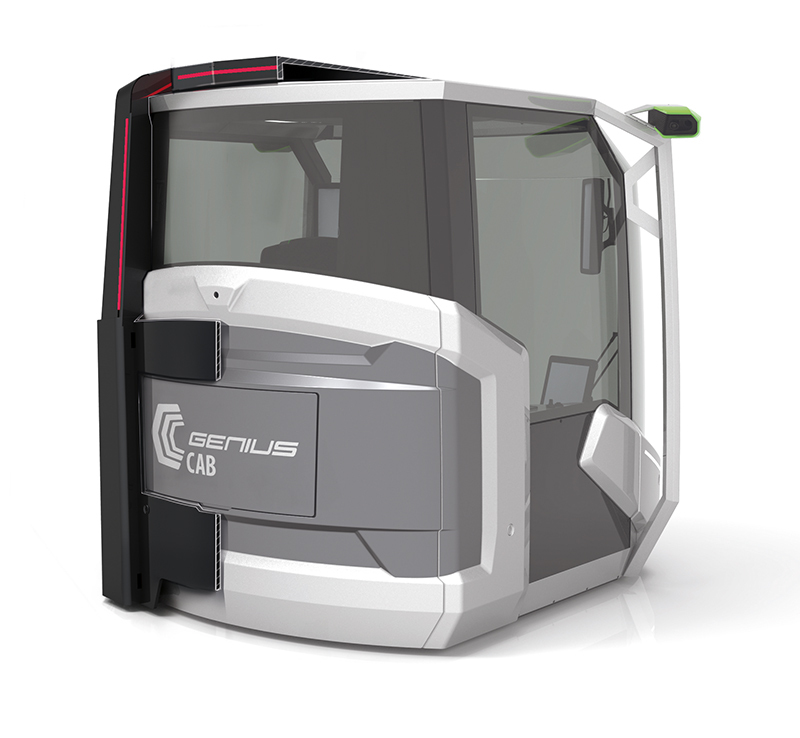 The exterior and interior of the Genius CAB were developed and implemented in the scope of a multi-manufacturer styling concept, resulting in a unique overall appearance inspired by a polished diamond. 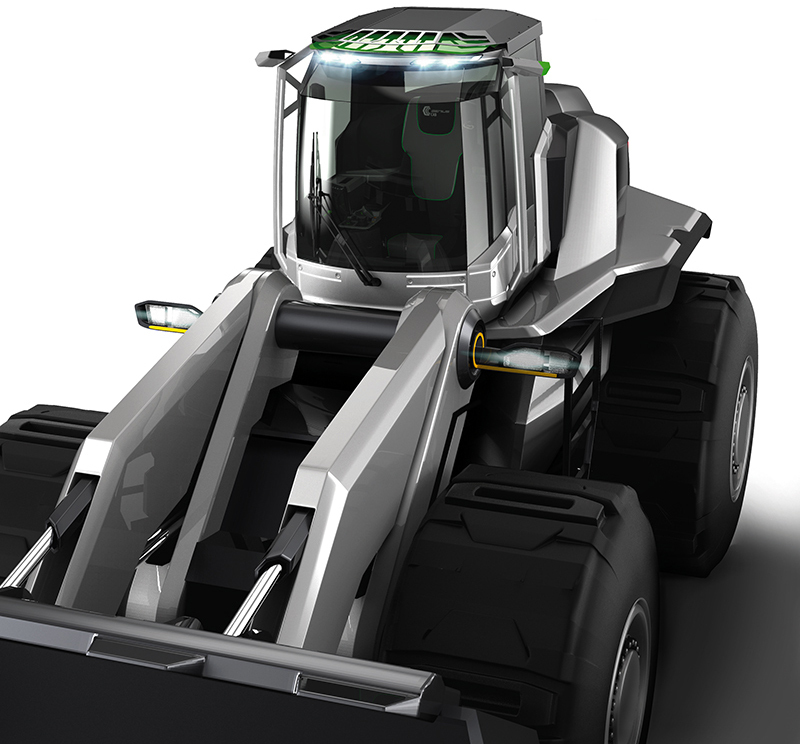 The concept received the innovation award “bauma Innovationspreis 2016”. Formative light lines that can be individually adjusted underline the unique branding. “Human Centered Design” as guiding theme ensures maximum ergonomic comfort in the workplace thanks to the large dimensions of the interior. 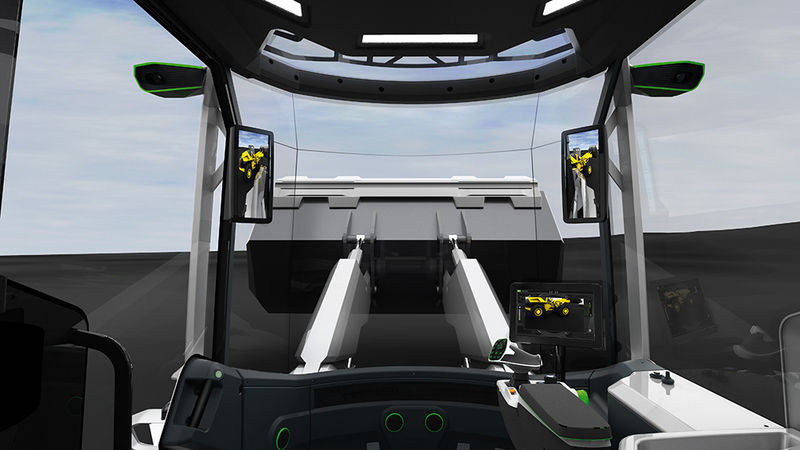 The glass cockpit with faceted window surfaces provides excellent vision. 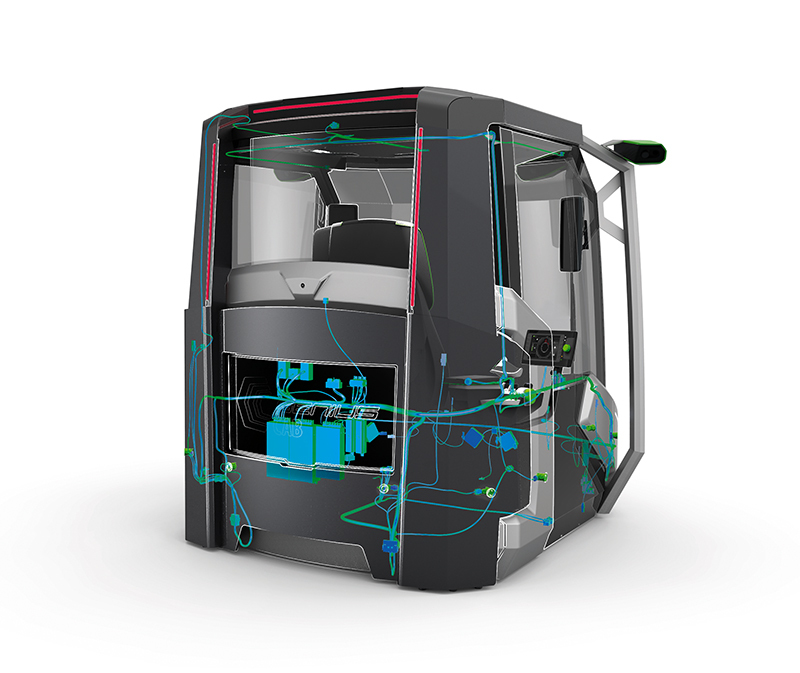 Reduction and simplification: this is reflected in the modular construction of the exterior with the integrated structure with a “softcab” made up of special welded aluminium profiles which have led a 30 percent reduction in weight and the fitting EXO-ROPS/FOPS which is additionally placed above the cabin and is suitable for weight categories ranging from 10 to 50t. The interior is equipped with a central touchscreen panel, which is integrated into the armrest of the adjustable seat along with the joystick. All functions and machine parameters that are controlled by the operator are centrally visible and adjustable even in adverse working conditions. An adaptive user interface collects the key parameters and ensures safe and expedient navigation. Another novelty is the CAN network of all functions and components. A body computer constitutes the control center based on a complex, modular CAN matrix and processes all incoming and outgoing signals. Intelligent cloud technology registers operation and application times of operator and equipment, equipment status and records possible damages. Ein A mirror replacement system combined with a variable rear view camera surveillance system and interior displays greatly improve all-around visibility, especially in conditions of darkness. Ultrasonic sensors detect hazardous situations and obstacles in the vicinity. Individually controlled work lighting is used in excavation processes (dynamically) and without mobile lighting systems. Air outlets together with the heating/air-conditioning system located on the side ensure outstanding climate control. The filter system equipped with RFID chips is easily accessible and improves the quality of maintenance. 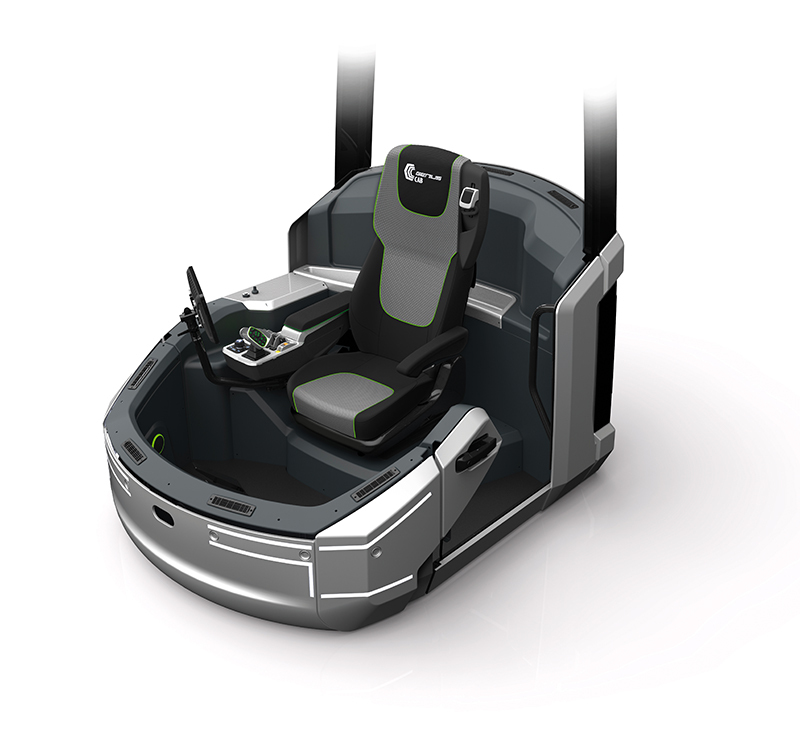 More information about the Genius CAB and the Cab Concept Cluster can be found at our brochure.